The 2018 season was the Sacramento River Cats' 18th in California's Capital region. 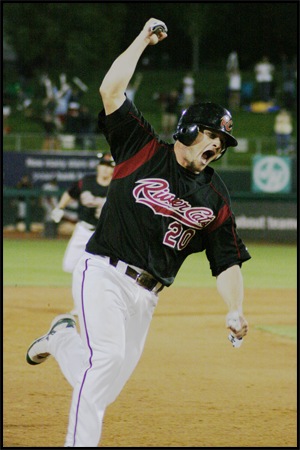 During those 19 seasons in West Sacramento, the River Cats have had unparalleled success on the baseball field - winning two Triple-A Championships (2007 and 2008) and four Pacific Coast League Championships (back-to-back PCL Championships in 2003 and 2004 and again in 2007 and 2008). The team has also won 11 PCL South Division Championships (2000, 2001, 2003, 2004, 2005, 2007, 2008, 2009, 2010, 2011, 2012). This 2018 season was the fourth in a new era for the Sacramento River Cats. After 15 seasons as an affiliate of the Oakland Athletics, the River Cats are now the Triple-A affiliate of the San Francisco Giants. Since 1904, the Giants have appeared in the postseason 25 times and won 21 National League pennants. After winning their eighth World Championship in 2014, the Giants became just the fifth franchise in Major League Baseball history to win three championships in the span of five seasons ('10, '12, '14). As an affiliate of the Athletics, the River Cats graduated a number of players to the Major Leagues, including 2002 American League Cy Young Award winner Barry Zito (A's), 2002 American League Rookie of the Year Eric Hinske (Blue Jays), 2004 American League Rookie of the Year Bobby Crosby, Eric Byrnes, Nick Swisher, and many more. Since the 2015 season, the Raley Field has hosted a number of up-and-coming Giants prospects, including Ty Blach, Jarrett Parker, Chris Stratton, and 2016 National League All-Star Adam Duvall (Reds). Off the field, the River Cats have consistently been the talk of Minor League Baseball. Winners of numerous awards for its business practices, sustainability efforts, and outstanding community presence, Sacramento's franchise has led all of the Pacific Coast League in attendance over the past 19 seasons, including the sixth-highest figure in 2018. The River Cats franchise was purchased by majority owner Art Savage in October 1998 and was relocated to Sacramento prior to the 2000 season from Vancouver (Canada). Formerly the Vancouver Canadians (1999 Triple-A World Series Champions), the River Cats call Raley Field home. Nestled along the Sacramento River in West Sacramento, the privately financed ballpark is the crown jewel of Minor League Baseball. JD Closser rounds third base after Danny Putnam hit a game-winning home run in Game 4 of the 2007 first-round playoff series against Salt Lake. The River Cats went on to win the series en route to their first Triple-A championship.